I've mentioned previously in passing that as I build the wealth necessary to reach Early Financial Independence I'm noticing that the major wealth contributor for me has actually been the Saving Hard portion of my strategy rather than the Investing Wisely. Let’s firstly quickly remind ourselves of what each portion contains. Saving Hard is the methods used to acquire Capital for investment. For me that is a full time professional career with Megacorp where I’m continually working to Earn More, as well as continually working on methods to spend less, while achieving the standard of living my family desires. The spending less is typically called Living Below Your Means or LBYM in the financial independence blogosphere. Investing Wisely is the methods used to maximise return on that Capital. For me it includes low investment expenses, tax minimisation, modern portfolio theory, tweaking of asset allocations based on market valuations and even my HYP. The below chart separates the wealth I've personally built each year from both Saving Hard and Investing Wisely. 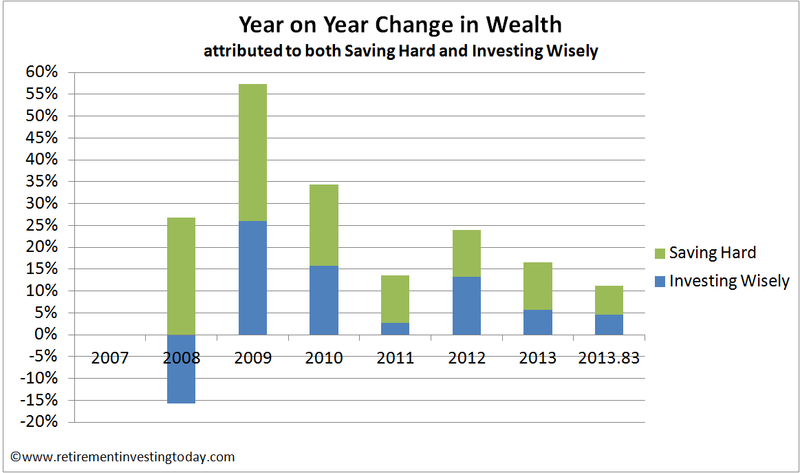 Every year except 2012 more wealth has been built from Saving Hard. It even includes the last couple of years where significant monthly savings are given to my better half so that Financial Independence day is synchronised. So as I alluded to at the start of this post for somebody like myself who’s trying to become Financially Independent in 10 years or so Saving Hard is essential. So Saving Hard is important. Let’s look at each element in turn. When it comes to Earning More I've been fortunate, having been able to increase earnings by 128% since 2007, however I can also say it has come at a price. I am also very aware that in the modern continually globalising economic climate where average earnings in the UK are increasing at a less than inflation 1.3% this is currently not easy and importantly is not 100% in our control. I'm going to ignore Earning More for the rest of this post for these reasons. On the flipside Spending is very much in all of our control and if we can find ways to Live Well Below Our Means then Financial Independence can beckon in short order. This is because the more you can LBYM, the more you can save per month (your journey to the goal), as well as the smaller amount of wealth (the goal posts actually coming towards you) you’ll need to build because of that lower spending. Let me try and quantify this with a simple fictitious example. Average Jane graduates with a STEM degree, finds a good job and by age 25 while unfortunately not having managed to save anything has fortunately been able to increase her earnings to £40,000. Here she hits a brick wall with her earnings and is only able to gather inflationary increases from then on. 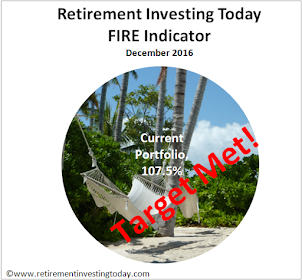 At 25 Jane also reads Retirement Investing Today, decides Early Retirement is for her and additionally follows some similar Investing Wisely principles to my own allowing her to achieve an after inflation average investment return of 4%. Under scenario 1 Jane reduces here costs a little and manages to save 10% of her gross earnings at the end of every year. In this scenario she’s paying £9,845 in tax, spending £26,155 and saving £4,000. Assuming Jane also intends to spend £26,155* post Early Retirement and decides to settle on a 4% wealth withdrawal rate (WR) in that retirement then she’ll need wealth of £653,868. Unfortunately this means Jane won’t be stopping work until some time in her 52nd year of saving by which time she’ll be 76 years young. Under this scenario she better hope State Pension Age is still 68 to bring that date forward. Under Scenario 2 Jane hunkers down, Lives Below Her Means and manages to save 20% of her Gross Income. She’s still paying £9,845 in tax but has reduced her spending to £22,155 allowing £8,000 of savings per annum. Now she only needs wealth of £553,868. With all other conditions being equal that bit under 52 years reduces to a bit under 34 years where she is 58 old. That’s Early Retirement which some might be happy with. Under Scenario 3 Jane really works at it, Lives Well Below Here Means and manages to save 50% of her Gross Income. Tax is the same but now the spending and saving balance has flipped with savings now beating spending by £20,000 to £10,154. Wealth required drops to £253,868. All of a sudden that bit under 34 years is at a bit under 11 years. Jane hasn't even made the grand old age of 36, is financially independent and has the option of Early Retirement. It might be for some, is probably too high risk (a 4% withdrawal rate is too high IMHO) and too young for me, but boy does it give her some options for how she lives the rest of her life. 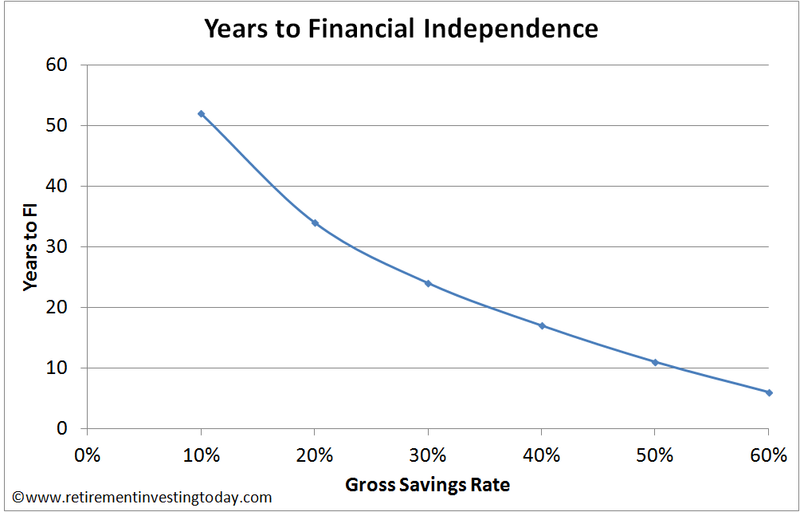 Gross Savings Rate vs Years to Financial Independence for all Jane’s scenario’s and more can be seen in the chart below. Enter Average Joe. He’s identical to Average Jane except he decides that a 20% gross savings rate is his limit. Instead he’s a super star investor and is going to achieve Financial Independence in less than 11 years through investing cleverness. What annual investment return does he need? 34%! A sobering thought indeed. * A quick note on post Early Retirement Spending. We are of course all different but I know that I will spend significantly less should I enter Early Retirement than I do today. One area of big savings will be work related costs where as a family unit we spend between 15 to 17% of our monthly net earnings on work related expenses. "as a family unit we spend between 15 to 17% of our monthly net earnings on work related expenses." Jesus wept: how? I wouldn't have thought that this is that unusual. Take the average UK wage for £26,500. If somone contributes 7% to their pension and paying back a student loan, then net income is £18,600. This equates to £1,550 per month take home pay, so 15% of that would be about £230 a month. Get on your bike. Or get a job closer to home. There's little point fannying about trying to minimise taxes and charges on investments if one sixth of your net income is leaking into "work related expenses". - Side 1 is the numerator of the equation. Work expenses are our 2nd highest spend category after rent. The major work related expenses are predominantly transport related. To maximise our savings I need to work a long way from home and when I say a long way think many hundreds of miles on the road a week. Even though I have a pretty fuel efficient car it still all adds up. - Side 2 is the denominator of the equation. After rental costs we don't need to spend a lot of money elsewhere for the standard of living we enjoy and what we do spend is done pretty efficiently as I've detailed in numerous posts. I guess you don't get to 55% gross (before tax) savings amounts spending large swathes of money. - what you do between 25 and 25 often defines how financially independent you are in your professional life. Meaning an experienced professional is highly valued, so this provides to a degree of financial independance, doesn't it? 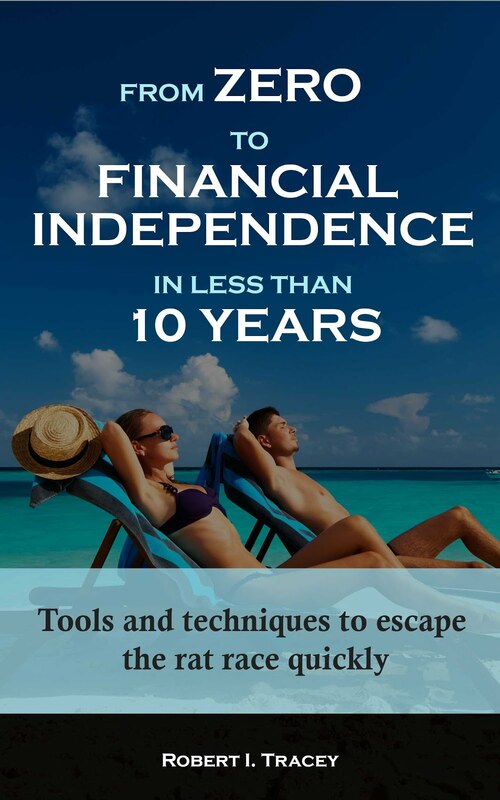 - i think implying that financial independence means economic inactivity is wrong. It is possible to be economically active person, but financially independent. Writing in 1998, Funder described delayed gratification as a "mixed bag." He concluded: "Participants who exhibited the most delay were not just 'better' at self-control, but in a sense they seemed unable to avoid it. …Delayers are in general smart and well-adjusted, but they also tend to be somewhat overcontrolled and unnecessarily inhibited. As always thanks for your thoughts. While the starting age and numbers are different to my own journey the principles being followed are the same. Let me therefore reply to each objection with my own experience 7 years in. 1. I agree once she is 35 there is no way to become 25 again as time waits for no-one. Has Jane done anything she'll regret though? To save at these levels Jane will have to spend time really understanding herself so that she only spends on what brings her health, wellbeing and happiness. Is this such a bad thing though? Looking at my own experience I am savings 55% of gross earnings and at the same time I'm carrying no regrets so far. Quite the opposite in fact. 2. Becoming a highly valued experienced professional is mutually exclusive from this private personal journey. As I mentioned in the post I've increased my own earnings by 128% which has required numerous 'promotions' over my 7 year journey. The only way somebody at work would probably put 2 and 2 together would be if they really stopped to observe the my clothes were maybe a little more aged than some colleagues as well as if they sat down with a calculator and summed up what my 'weekend' cost vs theirs. 3. I agree 100% that to be FI does not require economic activity. If I implied that it was poor wording on my behalf within the post. It was why I used the wording 'is financially independent and has the option of Early Retirement'. English is not one of strong points and is why I do the job I do. 4. I thank Funder for the compliment that I have self-control, am smart and am well-adjusted. My better half might not always agree though :-) I'd agree with the overcontrolled and unnecessarily inhibited bit also. I put that down to having to spend 11 hours in the 'office ' everyday. 2. Fine. Some think that working life is hell as it is, and some think it is just life as given to us to experience it. 3. It could be my mistake, as English is not my first language. I thought FI meant here as having the chance to tell the boss fu and retire in a beach house drinking beer and writing some staff. Do you actually think thats possible for a single person? It’s important for Jane to not get hung up on the c£10k but instead firstly focus on what in life is really important to her. She can then concentrate on only paying for that (plus with time learning how to minimise even that cost) and avoid spending on the rest. Only by looking at it this way will life be maximised for minimal cost. For example you’ve immediately assumed she’s a single person paying for rent and council tax. Why? At 25 she might be married, living with a boy/girlfriend or even share flatting with any number of people. I’ve personally done/doing all of these and have never lived alone on my journey. If Jane can't make it to £10k but can get to £12k with this method then that’s ok. We’re all different. At £12k she’s still FI in under 14 years. Even at £15k she’s under 18 years. Both put her a long way ahead of 34 or 52 years under the more traditional methods followed by many. As a person in my early 40’s I’ll freely admit I’m currently spending more than £10k given my current life situation. But as I have more experience than Jane I’m also fortunate to be a Higher Rate tax payer so can still maintain a savings rate of 55% of gross earnings. If you want a real life similar example to Jane then how about 32 year old Huw over at Financially Free by Forty. He’s set a target of no more than £950 per month (£11.4k) while actually averaging £825 (£9.9k) for a very healthy savings rate. I back RIT's example here, whilst acknowledging the readers point. There are some differences, but I believe that if I were to become single I could still save more than 50%. I would need to relocate/downsize, as housing would be my biggest expense, but I would review other areas to make up the difference. I earn around £30k a year, and I'm currently saving approx 70% of my total income. The other option is to increase income by various means to make up a higher saving %. Thank you for the kind mention, and I wish your reader the best of luck! As a single 36 year old male living in London I live on total expenses of about £85-£90 per week so living on less than £200 a week is pretty easy for me. I walk to work and rent a small box room in a shared house. Admittedly I hardly ever have entertainment expenses but I am ok with this especially as I am due to reach my FI goal in April. I hope in your 20th you experienced and went through it all - love, parties, travel, drama and misery. If so, I can only envy you. So does your financial independence plan involve sharing a box room for the rest of your life? The house is shared but there is definitely only room for one in my room! Once I am done in London I am off to somewhere with lower living costs (probably with more generous facilities). I have lived in shared housing most of my life so I am quite happy sharing a house and see no need to change this. As long as you know what you want for your future you can adjust your savings rate or saving period to reflect this.